On June 5, 2105, I wrote that American Realty Capital’s latest listing of a non-traded REIT was further evidence of the harm caused by sponsors of non-traded REITs. I also pointed out that, contrary to the common pattern in non-traded REIT listings, Schorsch and ARC used their control of the non-traded REIT version of GNL to tie the hands of shareholders and management in the subsequent GNL traded REIT and to opportunistically transfer wealth to themselves. I pointed out that similar self-dealing was observed in ARC’s listing last year of NYRT. See “Nicolas Schorsch and American Realty Capital Lay Another Egg” available here. 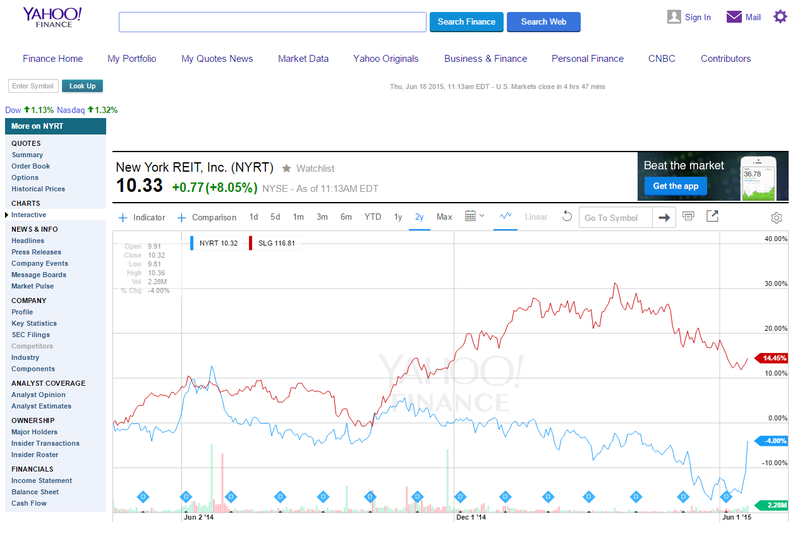 See my prior NYRT posts: “NYRT’s Listing is More Evidence That Even the Non-Traded REITs Winners Are Losers” [April 17, 2014] available here and “How is NYRT Doing?” [May 9, 2014] available here. This week a large investor in NYRT, Sorin Capital Management, wrote an open letter urging the NYRT board to sever ties to Schorsch and ARC. The letter is available here. Good luck to Sorin and other current investors undoing the harm done by Schorsch and ARC’s self-dealing. 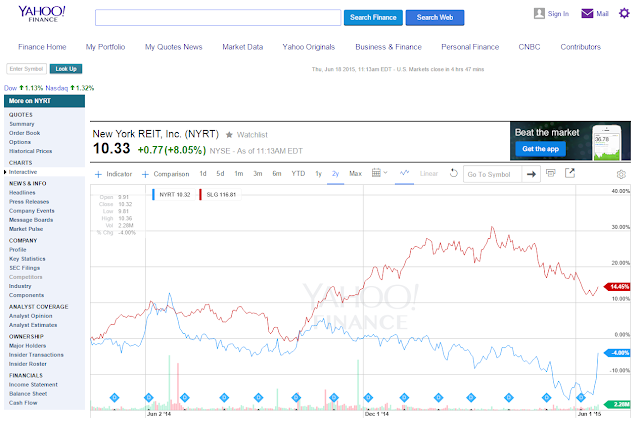 While Sorin may not have invested while NYRT was a non-traded REIT, NYRT management brought the worst of the non-traded REIT world forward past the April 2014 listing with it. It is no surprise at all that NYRT has underperformed its obvious peer SLG by 30% since NYRT listed. This morning - perhaps in response to the Sorin letter – an advisory firm has proposed to replace the Schorsch controlled advisor on terms more favorable to NYRT shareholders. In early trading today, NYRT is up 8%. Pressure should now mount on the NYRT Board to start behaving like fiduciaries and putting investors first. This picture is a dramatic testament to how easy it would be for the Board to fix what ails NYRT. The problems GNL and NYRT highlight are endemic in the non-traded REIT and DPP industry. These products wrap mundane investments in illiquid wrapper with enormous commission coupons attached to them. Unscrupulous brokers sell these awful investments to unsuspecting investors. My co-authors and I have determined that the non-traded REIT industry has transferred at least $45.5 billion in wealth from investors to sponsors and the brokerage industry. The first 41 non-traded REITs had cost investors $25.5 billion in lost wealth and 40 additional non-traded REITs which had updated their NAVs had cost investors another $20 billion in lost wealth. See “An Empirical Analysis of Non-Traded REITs” available here and “Fiduciary Duties and Non-traded REITs” available here .